I like to consider this image as demonstrating a "Bryce enhanced background". How many times have you taken a photograph and wished for an extra rock here, another branch there, or any other number of elements you needed to finish the composition to your satisfaction? You can use Bryce to create individual landscape elements, and "merge" them into an existing photograph with an image editing program (such as Paint Shop Pro or Photoshop). I took the photograph used in this image in 1989 with an Olympus OM-1 and an Olympus 50mm lens on 125 speed Kodak Ektar film. Additional elements for the final composition where created in Poser 3 and Bryce 4. I then "merged" the photograph with the new elements in Paint Shop Pro 5. I did not use layers, I went pixel by pixel as I combined elements and used a careful selection of various blurs. Can you pick out the artificial image elements?. 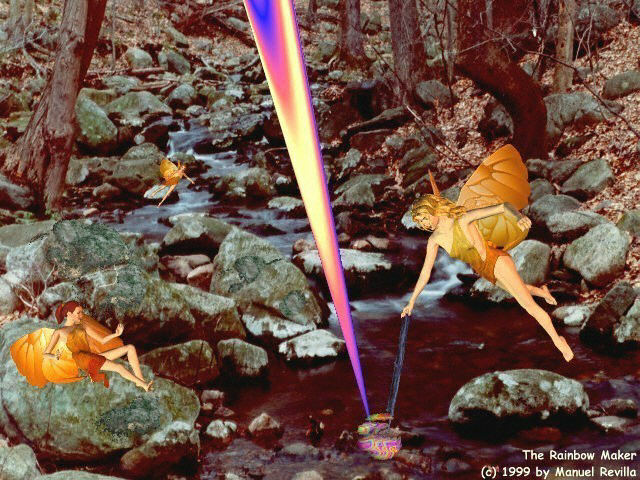 The Rainbow Maker is copyright 1999 by Manuel Revilla, all rights reserved.